The Samsung Book Cover snaps securely to the tablet to provide you with sturdy, durable protection for both the front and back of the device.⚠WARNING: Reproductive Harm - www.P65Warnings.ca.gov. Stylish design Get a style upgrade. 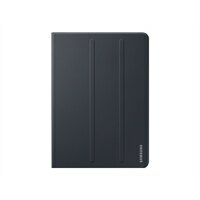 Reliable protection - without compromising on slimness. Versatile standing modes Adjust your Book Cover to three different standing modes to provide you with great ways to view your tablet. Durable protection The Book Cover provides protection against shock and scratches by safeguarding the front, edges and back of your device.